Spanish is the fourth most commonly spoken language on the planet and one with perhaps the largest geographical reach. Spanish speakers can be found not only in Spain and Latin America, but as well as in Africa, Asia, the United States, and nearly all around the world. Spanish is also the third most common language used on the internet. Since the Spanish language is also the language of some of the world's most preferred television shows, such as The Telenovela, it is more and more important for reaching great segments of the international population. If you are a business owner, politician, or just an individual with friends and family abroad, Spanish translation is an increasingly crucial part of the way you stay connected. However, Spanish translation involves more than just replacing a word for its English counterpart. Your Spanish translator needs to understand the intricacies of the language and the subtleties that computer programs and electronic translators can't catch. Let's say translators are aware that there is more than one type of Spanish, and words may represent one thing in European Spanish but something else entirely in Mexican Spanish. Also, idioms, slang, and particular ways of saying things play a significant role in any language, so your Spanish translator must understand the way these things are said in Spanish and English to be certain that your documents are rendered properly into English. A translation, after all, is more than a science, it's also an art, and the success of any translation job lies in the palms of the translators hands. 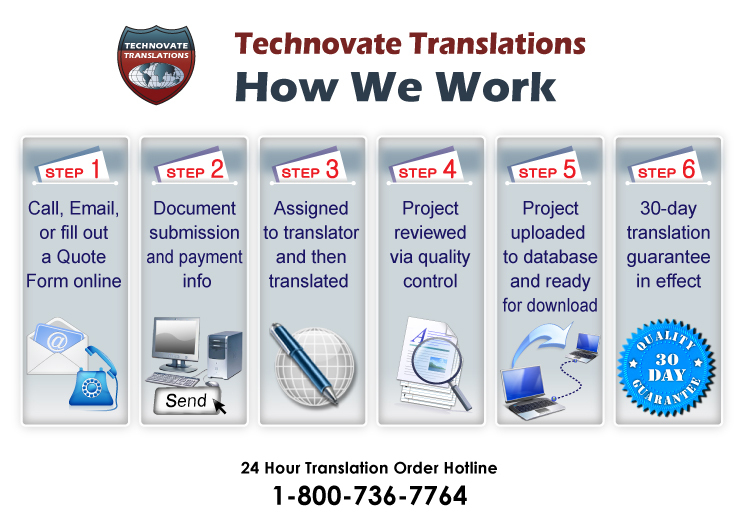 Technovate Translations understands Spanish translation and works tirelessly to get you the most precise and proficient Spanish translations in the industry. To do so, we work with only the most committed and knowledgeable Spanish translators. We ensure that they know Spanish inside and out to provide you with the most professional, fluid, and accurate translation possible. Furthermore, we pride ourselves in providing high accuracy on short deadlines, so we ensure the preciseness of all our translations with a unique quality control system. We have an additional specialized translator review our translations for precision and readability before sending the end product to you, our clients. This procedure guarantees that every translation is the best that it can be. If you need Spanish translation for your occupation, for education purposes, or for personal or legal reasons, we have the expert Spanish translators who can deliver for you. Our translators each have an area of expertise in which they specialize, meaning that financial translations are conducted by translators with experience with financial documents, legal translations by translators familiar with legal documents, and so forth. Doing so helps us to deliver the highest quality translations by giving you not just a Spanish language expert but a subject matter expert who knows the topics he or she translates to provide you with a better and more accurate translation.